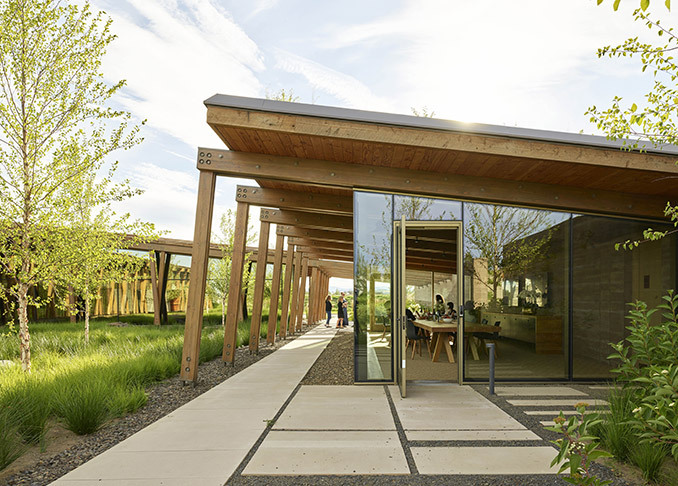 The owners of Washington Fruit & Produce set out to establish a bucolic work environment to serve as an elegant representation of the company and their intrinsic connection to the land. 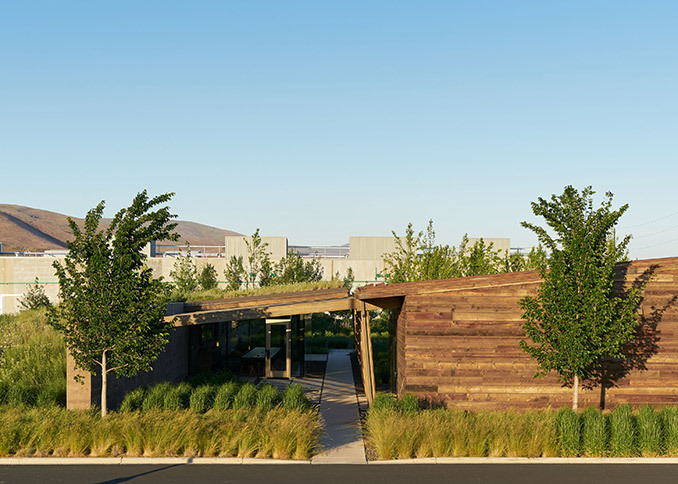 Located in Yakima, Washington, surrounded by industrial fruit storage and processing facilities, a simple earthen berm of native plantings wraps the building and envelops employees and visitors. This calming setting provides light-filled upward views of the surrounding hills while screening the nearby industrial activities. 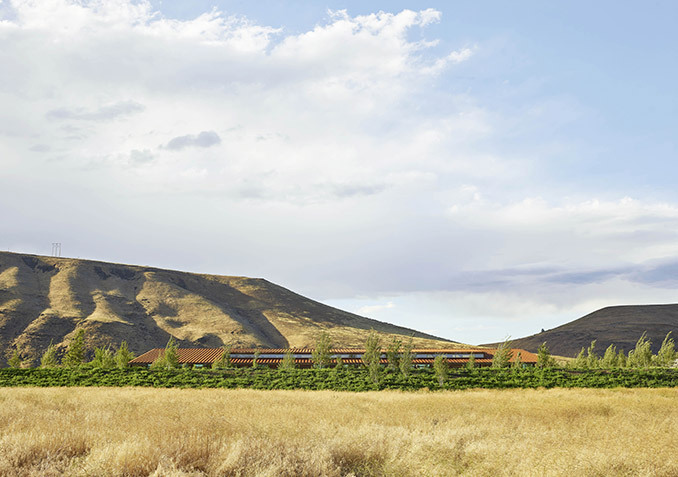 Located near the confluence of the Yakima and Naches Rivers, the site is part of a floodplain. Historic maps show the area cleared and regraded after the turn of the century for agricultural use and as part of what was then the Northern Pacific Railroad line that still passes to the east of the site as it heads through the gap in the hills created by the Yakima River. As part of balancing cut and fill on the site, a major landform was designed to embrace the structure and choreograph the entry experience. 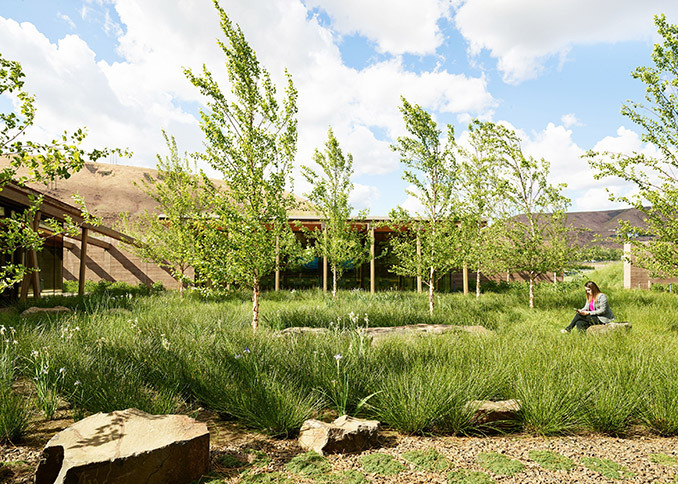 The landform serves several functions including controlling views into and out of the site while providing shelter for the structure and a focus for the interior courtyard. 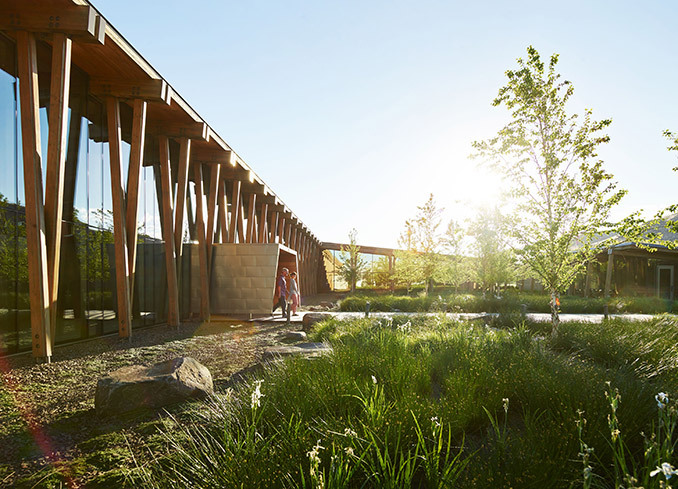 For building occupants, the berm creates a structured microcosm of the nearby riparian corridor and evokes a sense of enclosure and security in a wide-open space. 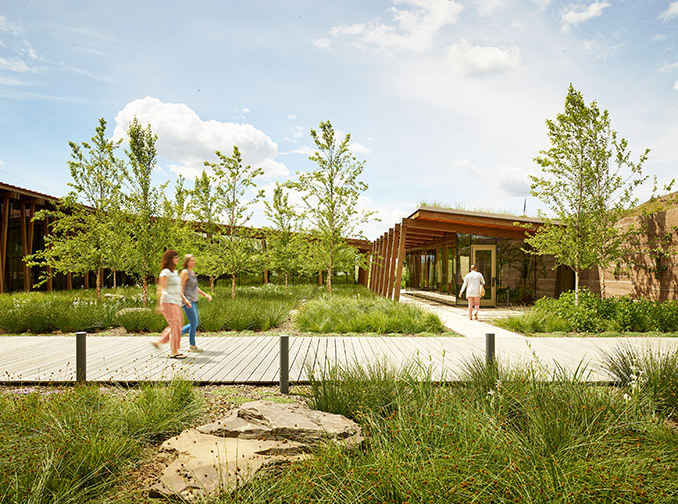 Much in the way the riparian corridor and river serve as an oasis in this arid climate, the courtyard provides a cooling and calming effect on visitors and employees. 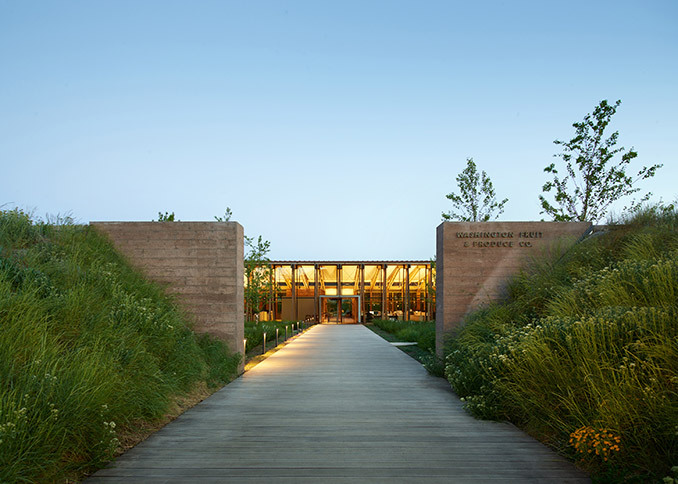 A large board-form concrete wall, chosen for its similarity to the roughhewn wood clad building, bisects the northern berm and connects to the earth-sheltered lunchroom. 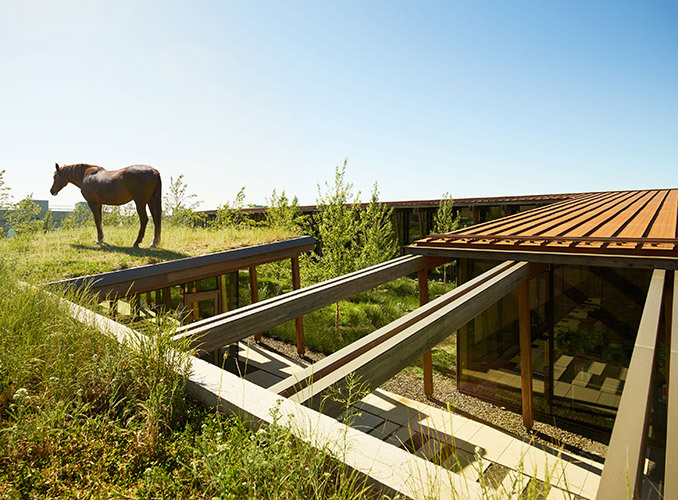 A living roof extends from the berm over the lunchroom, providing a literal and symbolic connection to the land. 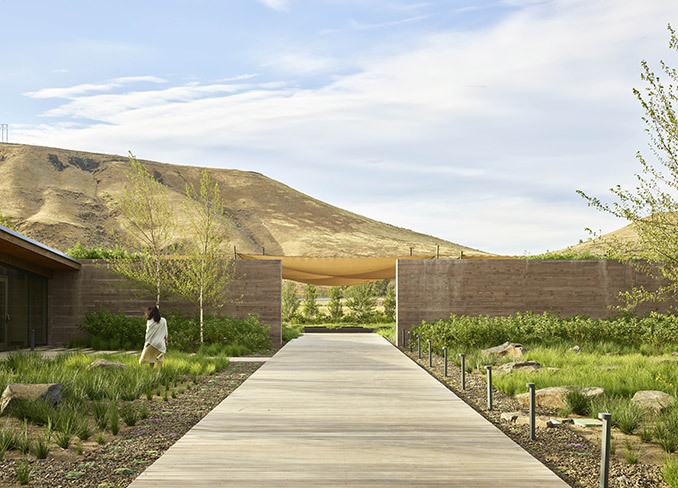 The wood-planked walkway to the main entry and exit point bisects the courtyard and peels back the berm giving those leaving the site magnificent views of the distant hills and the gap through which the Yakima River passes. 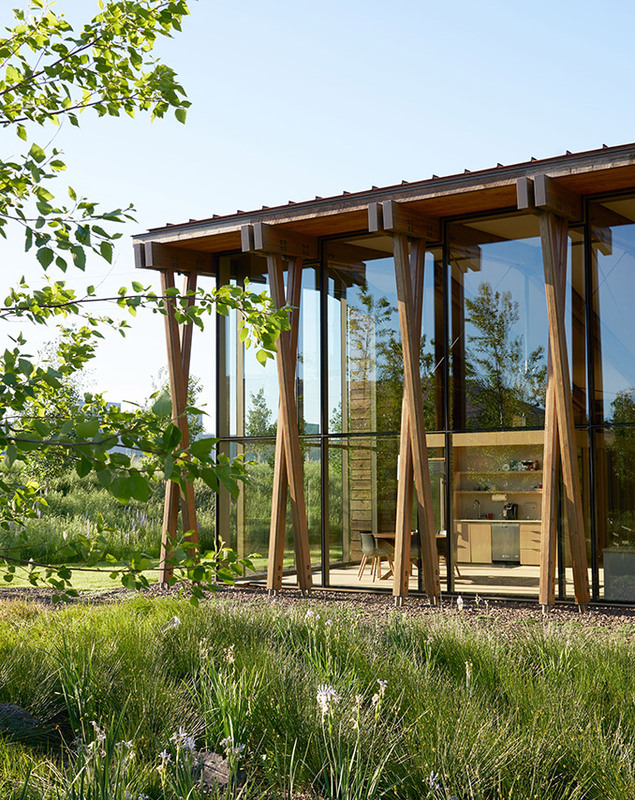 Floor to ceiling windows on all sides of the building flood the interior with views of either the courtyard or surrounding earthen wall ensuring everyone visual access to nature. 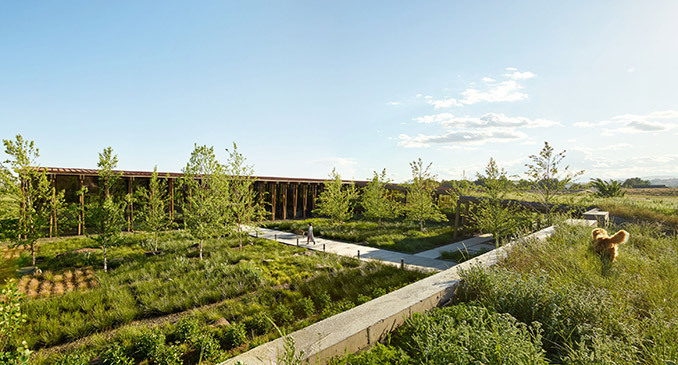 Receiving on average only eight inches of rain per year, the site accommodates the sustainable use of water. All stormwater is collected and infiltrated on the site, which reduces the irrigation demand for the plant materials. All soils and stones are from onsite or nearby local sources. Irrigation water is from non-potable sources. Locally grown native plants such as basin wild rye, bluebunch wheatgrass, shrubby penstemon, and globemallow were chosen to improve habitat, add interest and color, and for their suitability to the climate. Tree planting and the agricultural shade structure reduce the heat island effect. 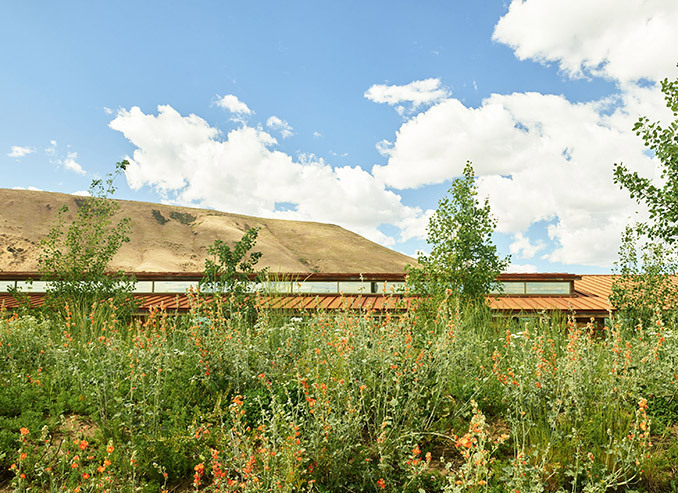 Native species selected from the nearby riparian corridor and the surrounding hillsides demonstrate their beauty and their ability to adapt to a managed landscape. 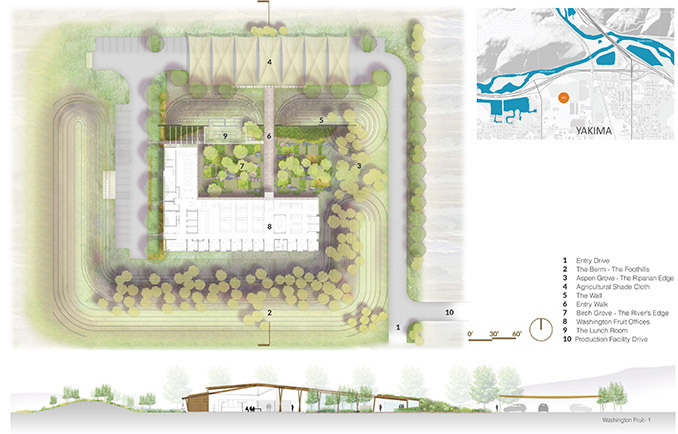 The layout is evocative of both natural patterns and the ordered row planting of the site’s agricultural past. Non-native but culturally significant DED-resistant American elms and sugar maples provide shade for the parking areas while serving as a reminder of some of the first ornamental trees planted in the valley. Washington Fruit & Produce Company and the community in which it resides have a strong connection to agriculture. 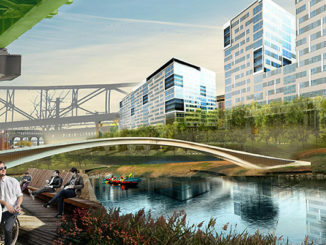 The design team sought to incorporate elements of that connection into the design. The core planting and native stones are laid out in a grid reminiscent of rows of orchards or crops. 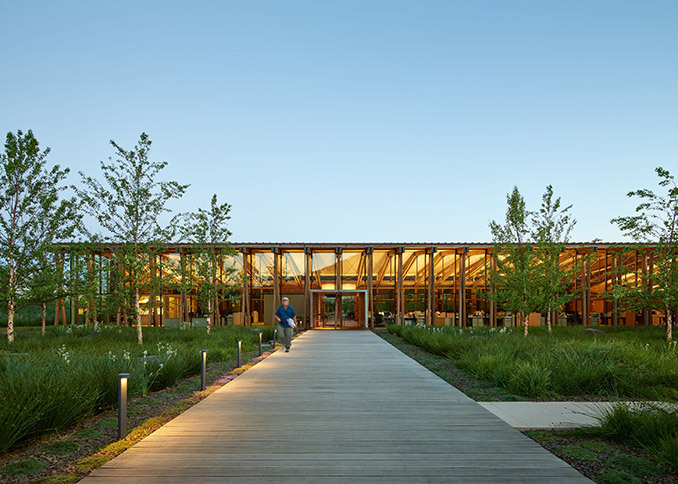 The grid dictates the layout of the building’s structural framework, and the building itself is evocative of a portion of an old barn structure. 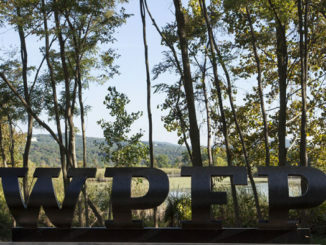 The shade structure marking the entrance and providing much-needed shade over the parking area is agricultural shade cloth stretched over a trellis typically used for growing hop vines. 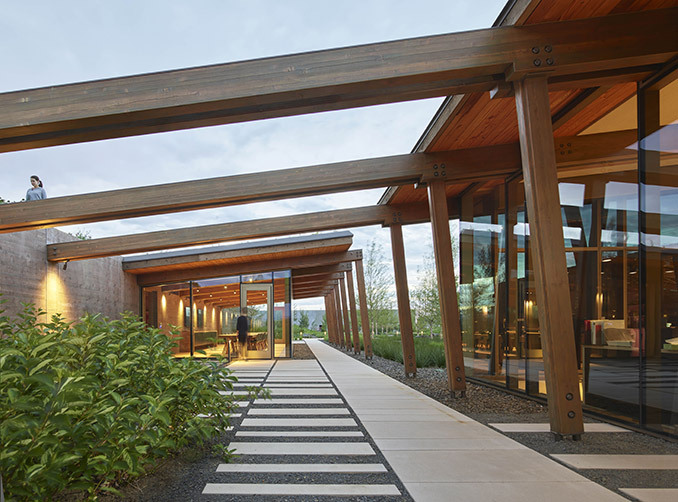 This handsome and honest corporate headquarters building and landscape far surpass the industry standard and serve as proof of Washington Fruit & Produce’s longstanding commitment to its employees, which in turn fosters a highly dedicated and productive organization.